When a frontal collision seems likely, the system attempts to lessen vehicle’s damage. Two types of pre-collision system are available. The brake-linked pre-collision system operates in conjunction with the braking operation of the driver. The radar type pre-collision system has a sensor that is used to detect an unavoidable frontal collision. Based on the speed and amount of the driver’s braking operation, the system determines if emergency braking is being performed. If this determination is made, the seat belts are immediately retracted to increase the effectiveness of the pretensioners . In addition, the system also operates if the driver loses control of the vehicle. If the pre-collision sensor detects that a collision is unavoidable, the pre-collision system will retract the seat belt before the collision occurs. The same will happen if the driver makes an emergency braking or loses control of the vehicle. However, when the VSC system is disabled, the system will not operate in the event of skidding. Detects vehicles or other obstacles on or near the road ahead and determines whether a collision is imminent based on the position, speed, and heading of the obstacles. When traveling on a road with very light traffic and very little to reflect the radar waves emitted by the radar sensor, the system may decide that the radar sensor is dirty, even if the sensor is not actually dirty. The system will automatically restore itself when reflected radar waves are detected. The sensor cannot detect plastic obstacles such as pylons. There may also be occasions when the radar sensor cannot detect pedestrians, animals, bicycles, motorcycles, trees, or snowdrifts. Vehicle speed is greater than about 4 mph (5 km/h). The system detects sudden braking or skidding. When the system is activated in the situations described above there is also a possibility that the seat belts will retract quickly and the brakes will be applied with a force greater than normal. When the seat belt is locked in the retracted position, stop the vehicle in a safe place, release the seat belt and refasten. Warning lights and/or warning messages will turn on or flash. Keep the sensor and front grille clean at all times. Clean the sensor and front grille with a soft cloth so you do not mark or damage them. If the sensor moves even slightly off position, the system may become inaccurate or malfunction. 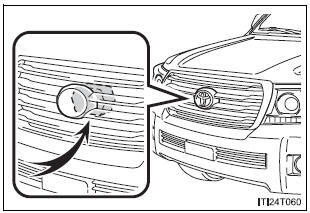 If the sensor or surrounding area are subject to a strong impact, always have the area inspected and adjusted by your Toyota dealer. Do not modify or paint the sensor and grille. Do not rely on the pre-collision system. Always drive safely, taking care to observe your surroundings and checking for any obstacles or other road hazards.